Yes! Can you Believe this? The Cognitive Disinformation is So in Everyone’s Face Engaged in the Current-System - but because the System provides Benefits to those who Support it, they simply don’t want to See it. They don’t want to See that Capitalism and Democracy are Not Only ‘Redistribution of Wealth’ - in the case of Democracy, it is the Violent Redistribution of Wealth like you’ve seen in the Arab Spring, Iraq, South America and all the various countries. Where, would you believe it - the Proponents of Democracy and Capitalism, which is the United States of America – are Actually the Perpetrators of this ‘Redistribution of Wealth,’ while They are the very people that Scream “Communism!” when anyone would Propose that Wealth should be Distributed Equally. 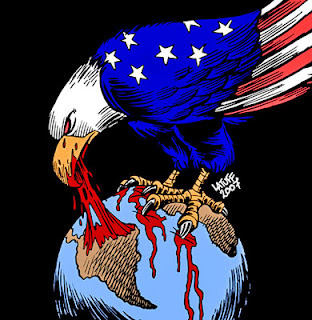 Instead, the ‘American Way’ of the Redistribution of Wealth is to Kill as Many People as Possible, Innocents - ‘Claim’ that That is ‘Collateral Damage’ and then to Redistribute the Wealth of these countries to The American People, specifically, the American Corporations. But - The American People All Benefit, so they’re Part of these Atrocious Actions. Within this, Capitalism is then Used to Redistribute the Wealth and the Right of Life of the rest of the World - Also to the American People. That’s why you have 25% of the Wealth of the World centered in America. To Keep it like that, they have the Necessary Army and Weaponry with which to Subdue Anyone that in Any way May Claim their Equal Right of Life to be on Earth, and If they Dare to ‘Say something’ (as History has proven, you can go and check the Documentaries - it’s there): There Will be Violence. The Violence would be Directed at ‘Removing’ any Dissident Voices that May in any way Show what the Americans are Really Doing. They are In Fact an Extreme Form of Totalitarian Communism with a Very strange kink in the cable: They, through Violence, take from Those who Cannot Protect themselves and Distribute the takings to the ‘Top Elite’ in America with ‘some benefits’ to the People in America, like having ‘Products Free’ (well, not ‘Free’, but ‘Cheap’) and having Basic Needs taken care of to a vast degree. This All is also busy Collapsing. You see, the Americans have Never really cared about Their Own People. The whole approach of ‘Pursuit of Happiness’ and ‘Self-Interest’ - you know, the “Right for you to Also become Wealthy”…that’s the Fascinating thing: “The Right for you to Also Become Wealthy” is so Entrenched that it is Protected with Violence. On the Internet you can see this very clearly. You have a Similar kind of situation coming out of Europe for instance, the two Primary Areas from which this Bizarre Behavior is coming - to use Violence and Bullying to try and Subdue Any Voice that May Claim that Life is Equal. The Behaviour, so Bizarre, that it is a Psychological Problem and Sociopathic in Nature. This type of Violent Behavior, whether it is in Writing or in Actual Actions - you can see being taken around the world. So, whether in Writing / Actual Actions – the Problem Is that: there is a Fascinating ‘Change of the Meaning of Words’ through Actual Actions, while at the same time the Words like ‘Democracy’ and ‘Capitalism’ are Presented to be something to be ‘Glorified’ through the Media and through Those that are being Brainwashed through Education and whose Brainwashing is being Motivated by Money, their Income and Protecting ‘Their Wealth’ - while the Only Real-Wealth, which is Life - is Not Equally Recognized for All on Earth. Thus, the actual actions of the Words like Democracy and Capitalism and the Presentation/Writing of the Words – change in meaning, and according to their meaning/value/definition given, will be protected/defended with Violence, to protect/defend Individual’s Right to become wealthy/remain wealthy. And so, the meanings of Words in either Action or Writing will deliberately be changed/altered to protect just that: an Individual’s Wealth/Money and will thus ‘attack’ anyone/anything that challenges their Wealth/Money/Status within this current World System/Money System. There are Actually, Here on Earth, No Real ‘Human Rights’. There are Only ‘WEALTH Rights’, and if you have Wealth - You Must be Protected. If you Don’t have it, “it’s your own Fault!” But the Fact that those with Wealth that’s got All the Guns with which to Force the Implementation of their form/their Definition/Meaning of ‘Democracy’ and ‘Capitalism,’ seems to be Missed by Everyone that Should Take Notice. This Mockery of the Value of Life, seems to go Unnoticed by the Internet-Mobs for instance, that would Attack us when we Share that Life is in Fact Equal and All should Have Equal Human Rights. Instead, like what is done through ‘The American Way’ - it becomes a Personal-Attack. Have a look at How the Americans would ‘take out’ the Personalities that would do whatever they can to bring about an ‘Awareness’ that ‘We should change the way we live on Earth’. ‘Taking out’ such Personalities and Protecting the Wealth of ‘the Few’ and Obviously the Voting Block in America. Is America Democratic? Obviously Not! You can go and try and start another political party in America, for instance based on Equality - and you’ll see it is Not a simple matter that can just be ‘accomplished.’ In Fact, the question would be: are there Even Any Americans Capable of conceiving the extent to which they are Brainwashed? That would be able to go Beyond their Fear (and they would Recognize this as ‘Fear’), their Fear of their Own Government and their Own People - to Stand up and Create an Alternative. They won’t! Because everyone in the past that’s done this has been Killed. You know Why? It’s so that You Can Fear it, Fear Standing Up.